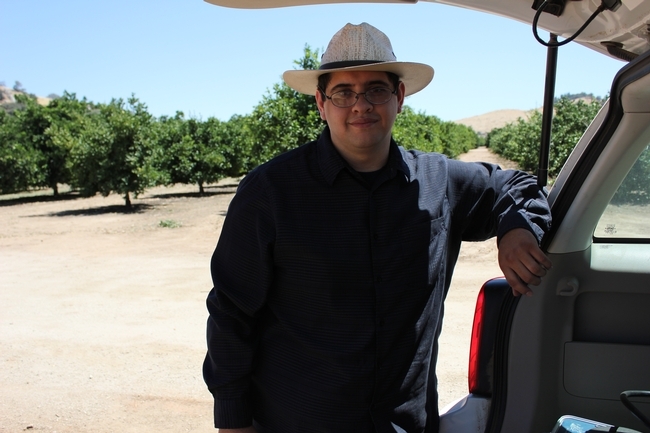 Hector Facundo, a recent graduate of UC Davis with a major in Statistics, has commenced an internship with UCCE Tulare County as part of the SURGE (Science Undergraduate Research Group Experience) program offered by the College of the Sequoias (COS). Working under the mentorship of UCCE Farm Advisor Elizabeth Fichtner, Hector is assisting with the collection of field data in the walnut root treatment study located at the Lindcove Research and Extension Center (LREC). Utilizing his academic background in statistics, Hector is responsible for both the collection and analysis of tree physiology, nutrition, and growth data in response to root treatments with commercially-available biological and biorational products. Hector will be presenting a poster of his work at the annual COS STEM (Science Technology Engineering and Mathematics) Symposium in August. Upon completion of his SURGE internship, Hector will begin his MS in Statistics at California State University, Fullerton. Duane Goodwin, SURGE Activity Lead, continues to strengthen relationships with local researchers, both in the academic and industry sectors. Hector is the fourth intern partnered with UCCE Tulare County and conducting research at LREC. Emphasizing and illustrating the quality of students entering the SURGE program and their subsequent academic success, all interns hosted by UCCE Tulare County have progressed to BS and MS programs at 4-year universities and graduate schools. For more information on the UCCE programmatic news on nuts, prunes, and olives, click here. College of the Sequoias SURGE intern Hector Facundo begins project at LREC. Hector Facundo uses a pressure chamber to collect readings of midday stem water potential in young walnut trees. 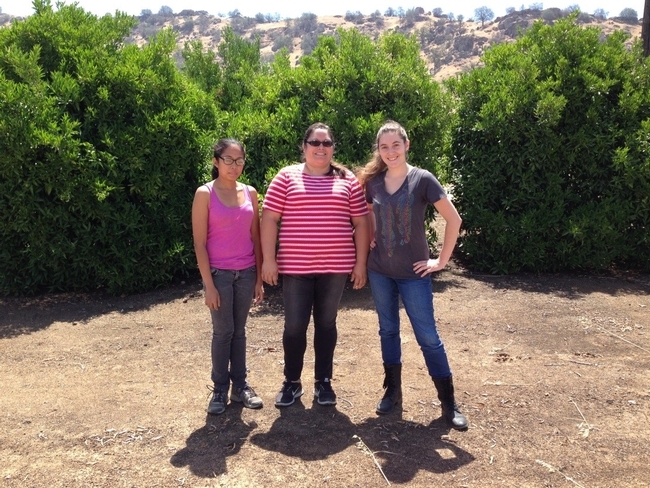 University of California Cooperative Extension (UCCE) in Tulare County and the Lindcove Research and Extension Center (LREC) co-hosted three College of the Sequoias (COS) interns enrolled in the SURGE (Student Undergraduate Research Group Experience) program. 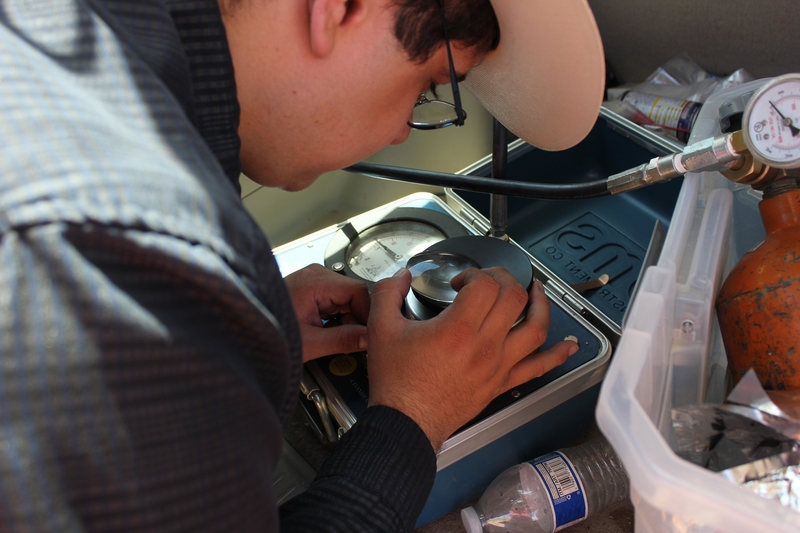 Student research programs are completed under the academic mentorship of UCCE Advisors, while LREC provides the land and laboratory infrastructure to achieve research goals. Elizabeth Fichtner, UCCE Farm Advisor covering nuts, olives, and prunes, initiated the partnership with COS in 2014, and was joined in 2015 by Allison Ferry-Abee, UCCE Farm Advisor covering viticulture. Yelena Martinez, a COS Chemistry major, was the first SURGE intern hosted by UCCE and LREC. Yelena's 2014 project focused on plant physiology and the potential for plant growth regulator treatments to mitigate alternate bearing in olive. Since completion of her internship, Yelena has worked as a Student Assistant in Fichtner's research program and has additionally worked for LREC on the annual citrus tristeza survey. Yelena plans to transfer to a 4 year university in 2016 to complete her BS in chemistry. Stephanie Doria and Edra Lona, 2015 SURGE interns, are conducting research in the new plant pathology laboratory at LREC. Both students' projects address replant issues associated with pistachio bushy top syndrome, a newly recognized disease caused by a plant pathogenic bacterium. Stephanie was a Biology major at COS and is transferring to UC Davis to complete her BS in Evolution, Ecology, and Biodiversity. Edra was a RN/Biology major at COS and is transferring to Fresno State to complete her BS in Microbiology. Since completing their SURGE projects, both students have joined Fichtner's research program as Student Assistants and will continue working at LREC until the commencement of the fall semester.